In the previous chapter we discussed how during inter-store transfers, stores sending merchandise make Out Slips while stores receiving merchandise make In Slips. In order to ensure tight control over the process and make sure inventory is not lost in transit, In Slips are linked to Out Slip through the Out Slip Number, though the receiving store cannot see which merchandise was sent by the store of origin. 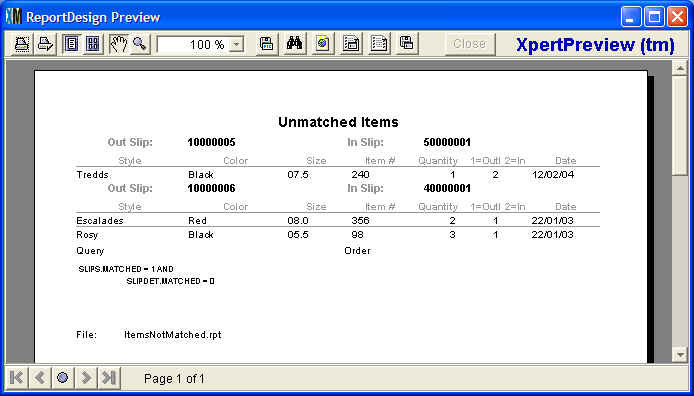 Control comes through a two step process called XpertMatch™. 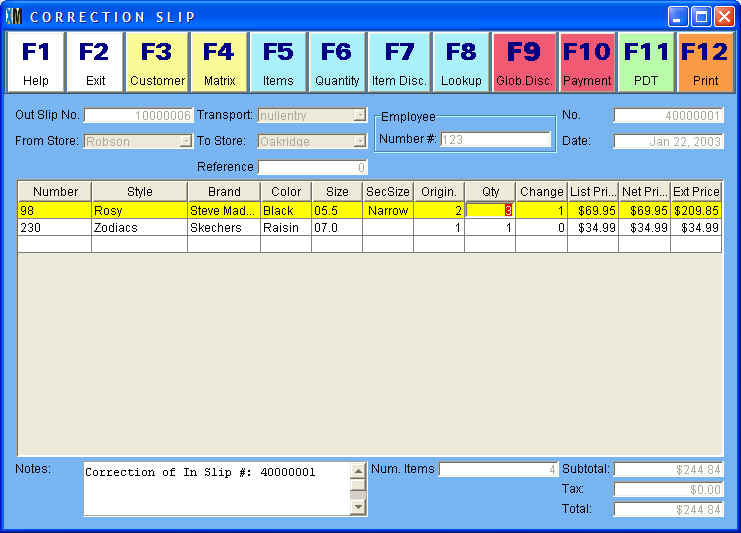 During this process the system: 1) looks to match all Out Slips with corresponding In Slips, and 2) looks for discrepancies between items reported as sent in the Out Slip and items reported as received on the In Slip. In other words, XpertMatch™ quickly tells you whether all transfers successfully arrived at their intended destination and whether the correct merchandise was received. Once the process is finished, you can open the Documents>Transfers>Out Slips catalog and view the results. 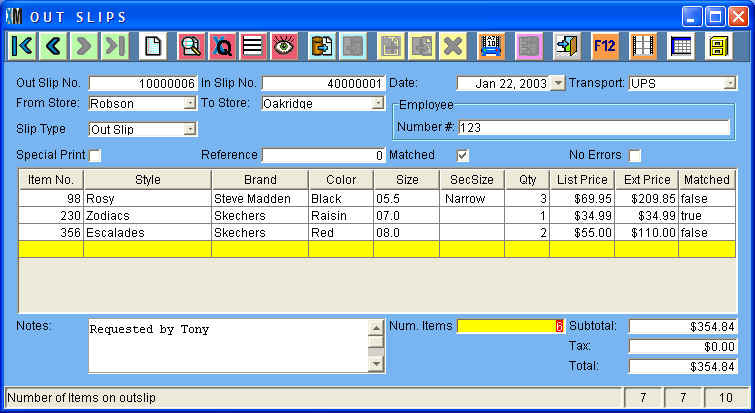 Every Out Slip in the catalog has two checkboxes in addition to the usual transaction information. 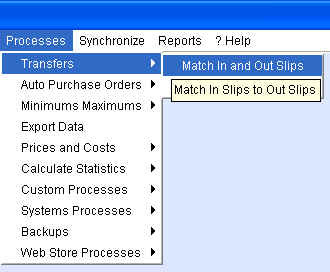 The "Matched" checkbox indicates whether a corresponding In Slip was found for the Out Slip. 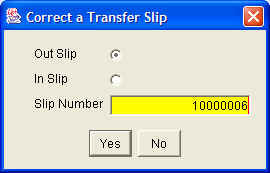 If it was, the box will be checked and the In Slip number will be automatically entered in the "In Slip No." field. If the Matched checkbox is not checked, then the merchandise is still in transit--either because the receiving store is several days away or because the shipment has in fact been lost or has not properly recorded. 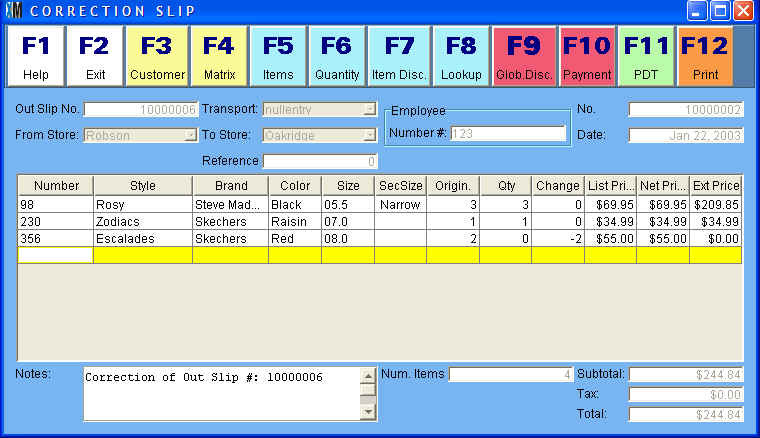 If the Out Slip is matched with an In Slip, the system checks every line in the Items Area for errors. An error is a mismatch in any of the following: the Style, Size, Color, Second Size and Quantity. 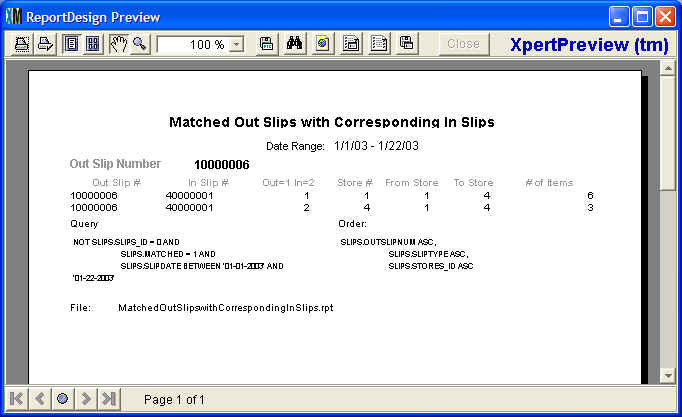 If there is a discrepancy between what is on the Out Slip and what is on the In Slip in any one of these five variables, the system considers it an error and writes "false" in the Matched column. If all five of these dimensions are the same, the system writes "true" in the Matched column. If all lines in the Items Area are "true" then the "No Errors" checkbox is checked. The Unmatched Out Slips without Corresponding In Slip report shows the opposite: those Out Slips which have yet to be matched. These are the Out Slips that reuquire immediate management attention. You should find the unmatched Out Slips in the Documents>Transfers>Out Slips catalog and see whether the merchandise is justifiably still in transit (the receiving store is far, the mode of transport is slow, etc.) or whether there is in fact a problem. The other useful report that requires management attention is the Unmatched Items report. 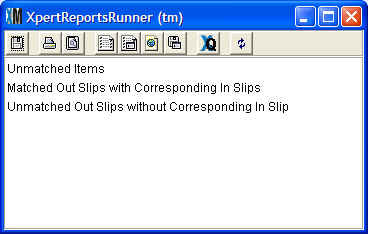 This report lists all items found on matched Out Slips that are on the Out Slip but not on the corresponding In Slip and vice-versa. In the exmaple below we see that the 3 Rosy Balck 5.5 pairs were not properly matched (only 2 were received) and the 2 Escalades Red 8.0 were also not matched (none were reported as received). Managers should use this report to control merchandise loss. By looking in the Documents>Transfers catalogs they can find the employees responsible for making both the Out Slip and In Slip in question and determine where the mistake was made. Once they have, they can proceed to fix the mistake by making Correction Slips. In keeping with our Philosophy of Control, if a mistake was made on an Out Slip or In Slip the original slip cannot be deleted or edited. Rather a new Document, a Correction Slip, needs to be made. This way there is always an audit trail that can be traced. The "Origin." column displays the quantities on the original slip. If you want to modify one of these, enter a new quantity in the "Qty." column. 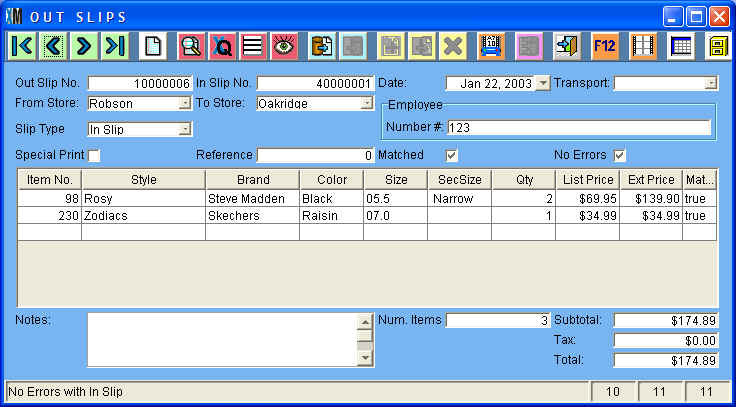 The difference between the original and modified quantities will be automatically displayed under the "Change" column. You can also add a new item that was not on the original Slip. Notice that the Notes area is automatically filled in with the text "Correction of Out Slip #: 10000006". In the example above, the 2 pairs of Escalades Red 8.0 shoes are being removed from the original Out Slip. In the exmaple below, the quantities received in the original In Slip are being modified. Instead of receiving 2 pairs of Rosy Black 5.5, the original In Slip is being corrected as showing that 3 pairs were received. We can see the original Out Slip (10000006) that subtracted 3 pairs from the Robson store and the original In Slip (40000001) that added 2 pairs to the Oakridge store. We also see the In Slip Correction that added the third paird ot the Oakridge store. All items are now properly accounted for.